Base 434 posted a reminder that today marks the memorial day, where we should remember Lukas Knutsson. Lukas was one of the first BASE pioneers, and one of the people who opened up the world of wingsuit flying and base to the people sitting in front of their computer screens by showing some of the best and fastest flying possible. Check out this memorial video, made as a tribute to a man who's name every wingsuit jumper should know. 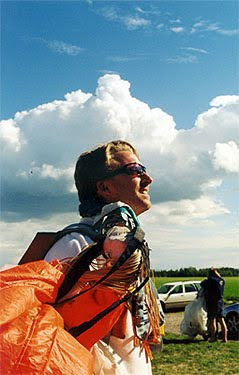 Lukas Knutsson is remembered through his website www.lukieland.se and the yearly Cold Steel award, given to a skydiver or basejumper for contributions to the sport, is a lasting memory of the mans legacy! Webbased TV show - Joe Genius "Wingsuits"